Hope you're off to a great start to the week! I'm moving a little slowly this morning. I had a terrible time sleeping last night for some reason. Nothing that a good breakfast and a stop by Starbucks can't cure! I wanted to share with you all how I like to lunch during the week. Since I am hooked on the oatmeal for breakfast, and I often incorporate a small serving of carbs at dinner, I try to minimize the carbs and maximize the protein at lunch, whenever possible. It's all about the balance. Not all salads are created equal. I'm sure all of you have learned this by now. We cannot kid ourselves by going to a restaurant, ordering a salad, thinking we are being "good" to our bodies, when really we are ordering 5 pieces of lettuce under a huge mound of cheese, fried chicken, tortilla strips, creamy dressing, bacon, I could go on... It's amazing they way they can pack cellulite into something that, in theory, is supposed to be good for you. If you need a wake up call on the truth behind restaurant salads, check out this Today show piece on 5 restaurant salads that are worse than a Whopper. I was most shocked by a childhood favorite salad from Applebees, the Oriental Chicken Salad. This bad boy will run you 1310 calories and a whopping 93 grams of fat!! Yikes! What about changing out the fried chicken for grilled (that was my first thought)? You're only down to 1250 calories, 73 grams of fat, and you've somehow now increased the sodium to 2290 mg (I guess someone in the back is pouring salt on the chicken to replace the breading??). As you know, I don't typically keep track of calories and fat, but sometimes I do look up the values for restaurant items to see what I am really putting into my body. With all that said, I still love a good salad for lunch, so how do I check myself before I wreck myself? 1) I *try* to pack my own salad to take to work or school on the majority of the week days. This way I know exactly what is going into my salad, and I can control the portions. On my weekly grocery store trips, I pick up lettuce, my favorite veggies, chicken, and sometimes low fat cheese. 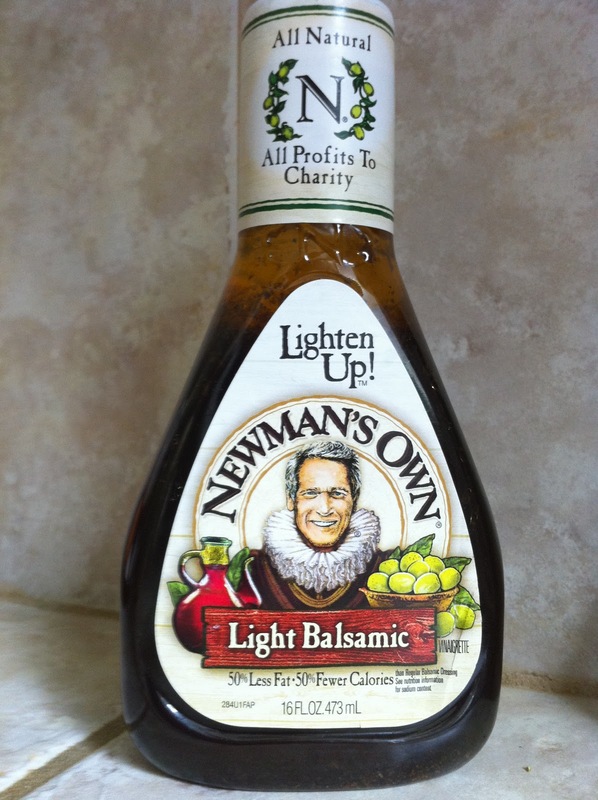 I also keep on hand my favorite balsamic dressing and sliced almonds. I take some time on Sunday or Monday mornings to chop up the veggies and put them into tupperware so that I can quickly put together my salads throughout the week. Fresh Express Sierra Crisp Herb Mix (this stuff is GOOD. ), Marzetti Light Balsamic, Light Swiss Cheese, Corn, Sliced Red Bell Pepper, Natures Seasoning, and (in the salad) Grilled Chicken (marinated in garlic lime vinaigrette). I change up the ingredients depending on what I'm craving each day. And no, I do not belong to a tupperware club (yet! ), this guy is from Target (about $9.99)! This container is PERFECT for making your own salads to go. It holds a good portion of salad, incorporates a snap-in ice pack to keep you dressing and the greens cold in transport, and has a dressing compartment (holds about 4 tablespoons of dressing, so be careful because "technically" a serving is 2 tablespoons) that you twist and the dressing drops into your salad, and then you SHAKE SHAKE SHAKE! It's pretty great. 2) I treat myself to my favorite salad from my restaurant of choice once or twice a week, and make healthy alterations and portion control. My current favorite salad is a fire roasted veggie salad with grilled chicken and blue cheese. Even though my inner mouse LOVES the cheese, I often order without, depending on whether I am planning to have cheese at another meal that day or if I had a lot the day before. One great tip I have for those of you, like me, who sometimes enjoy picking up a salad, is to keep your OWN dressing in your home/work fridge. The fire roasted veggie salad I enjoy comes with a creamy balsamic dressing that is to die for, but I know it has got to be packed with bad news. Do you guys have any tips for keeping salads the *good greens* instead of a recipe for disaster? Hope you all have a fantastic day! I'm in for busy one (school, work, squeeze in a work out, homework, biggest loser/american idol? ).